These instructions apply for using DVD-sourced material in FCP. If you just want to re-burn the material in a different layout, use the Demux to ac3 and m2v options, and import those assets into DVD Studio Pro. If you want to rip content for use in a presentation, ie you need it compressed to H.264, you can just use Handbrake, or use this method with different export options. DO NOT STEAL COPYRIGHTED MATERIAL. Before you begin: Make a project folder, and keep all the files pertaining to that project in the same folder. This keeps you from scattering files all over your disk and makes the project easy to relocate to another drive. 1. Download MacTheRipper and use it to copy & decrypt the files on the disc to your hard drive. Eject the disc when done to avoid confusion. When it’s done, you may want to open the resulting VIDEO_TS folder with the DVD Player application to see if the rip was successful- fast forward to the end to make sure you have the entire disc. 2. Download and use MPEG Streamclip to open the files you just created. Choose “open all” when asked, uncheck the box that says “do not skip frames” and click fix now when asked about timecode breaks. 3. At this point, you can optionally use I and O, and the usual JKL playback controls just like in FCP to select which scene you want. Otherwise, just convert the entire movie. 4. Choose File > Export to Quicktime (not DV!) Select settings to match the attached screen shot, and click Make Movie. *-Notes: if you have FCP 6 or 7, and you have plenty of free disk space, pick ProRes 422 instead of DV from the popup menu at the top. This will give you much better picture quality. If you are sure that your source material is already deinterlaced, unselect all the options in the interlacing section and you’ll get better results. 5. 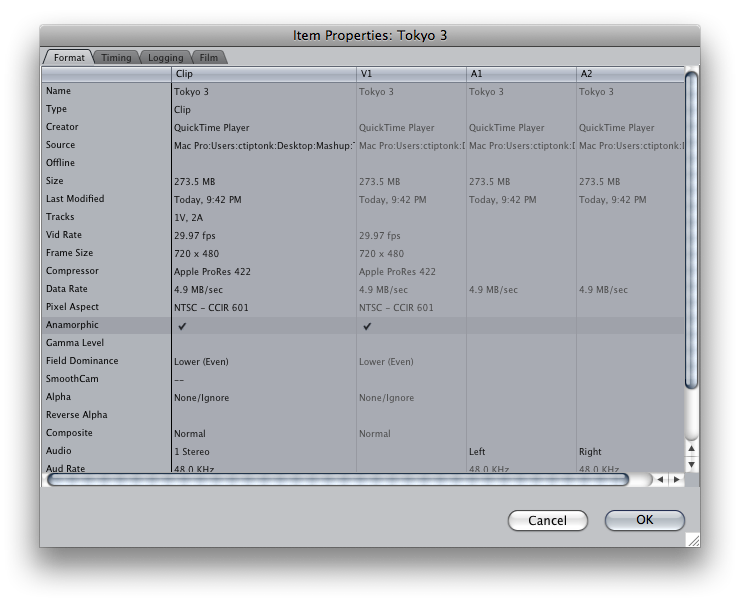 Import to FCP. If you imported a widescreen movie, there is one last step- select the clip in the browser, and press command-9 for item settings. Find where it says “anamorphic” and check the box (see screen shot). If you don’t, the aspect ratio will be wrong! 6. When you add the first clip to the timeline, click Yes when asked if you want to conform the sequence settings to match the clip (assuming the ripped material will be your primary source of footage). Viola! When I use the above settings, the resulting .mov is noticeably lower quality than the .VOB that it came from. Lots of pixelation. Any advice? Are you viewing it in QuickTime player without “use high quality” enabled in preferences? The reason I began getting poor results from MPEG Streamclip is because I began using the “Deinterlacing” feature. And of course deinterlacing reduces image quality (if it’s a lousy deinterlacing filter, like the one in Final Cut Pro). But I did not realize this until yesterday! Here is what I do not understand, and maybe you can explain: On my flat-screen, if I move a movie along one frame at a time, I see no interlacing. If I rip that movie, the movie on that VOB also has no visible interlacing. HOWEVER, once I place that VOB onto MPEG Streamclip, guess what? EXTREME interlacing appears! And if I place that VOB onto Final Cut, same thing! And now, once I have converted this VOB to a .mov and burned it back to DVD, the interlacing DOES show up on my flatscreen! And it is TERRIBLE. 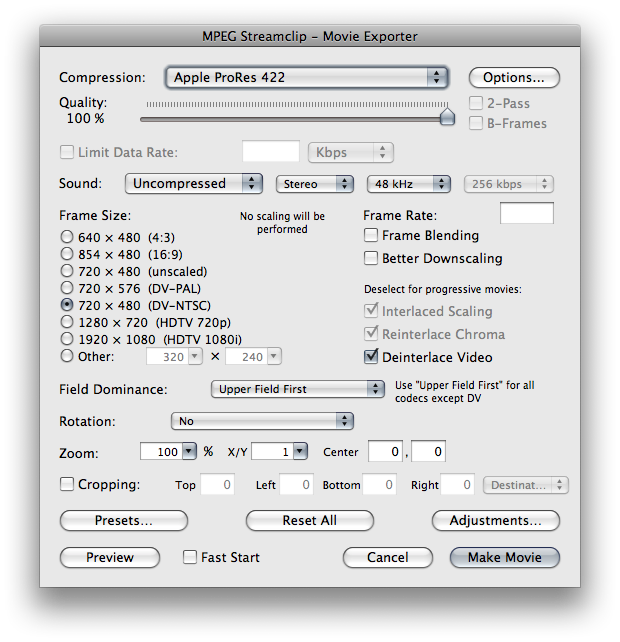 Why does MPEGS and Final Cut INTRODUCE combing onto movies, and what can I do to get rid of it without destroying the quality of the image? Please let me know any thoughts you have. Thank you! It depends on your source material, which might be interlaced, progressive, or 3:2 pulldown. If your source material is interlaced, probably your DVD player/TV, and definitely the DVD Player app on your computer is doing the deinterlace on the fly. To get the best deinterlace results, use the progressive and deinterlace “better” or “best” options in Compressor.